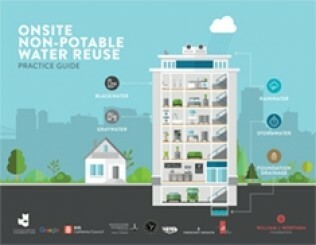 Announcing the Onsite Non-Potable Water Reuse Practice Guide, co-authored and co-sponsored by MKA, serving as a resource for building design practitioners that demystifies the integration of water reuse functionality into the building design process. The guide seeks to impact development practice by making onsite water recovery and reuse the norm and not the exception. Industry champions include William J Worthen Foundation, Charles Pankow Foundation, Google, AIA California Council, Magnusson Klemencic Associates, City of Santa Monica, Water Environment & Reuse Foundation, Crescent Heights, and Urban Fabrick.